When I wrote that I thought Wandsworth Labour must have been disappointed with their result I didn’t realise quite how disappointed until I looked at how their colleagues across London performed. Much as it pains me to say it, it was a good night for Labour in London. After the 2006 elections 14 London councils were Conservative controlled, 8 controlled by Labour. Following last Thursday’s election the figures are now 11 and 17. A fairly drastic reversal of fortunes. Looking at our immediate neighbours the story is fairly mixed. In Lambeth Labour solidified their grip on the borough at the expense of both the Conservatives and Lib Dems. Merton council remains in no overall control, but finely balanced – Labour now hold exactly half the seats, the same position the Conservatives had been in from 2006. Over to the west Richmond has become Conservative controlled, taking 12 seats from the Lib Dems in a two way fight. Elsewhere Labour took control of Brent, Camden, Ealing, Enfield, Harrow, Hounslow, Islington, Southwark and Waltham Forest. And in some of those the shifts were fairly dramatic, making double digit gains – which brings home Wandsworth Labour’s lack of progress. It seems fairly clear that the increased turnout of a national election can have a dramatic effect on the a local election poll. What gets me, though, is the irony that the party who have created a financial disaster nationally have been asked to fix it in so many places locally. 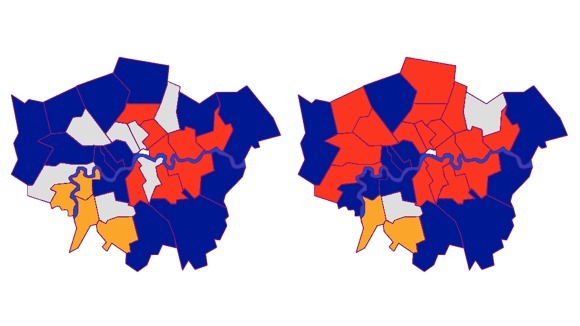 The Conservative vote seemed to hold up much better south of the river. It’s an interesting picture. I did, originally, think it might just because because we did better against the Lib Dems than against Labour (and Lib Dems are stronger in the south west of London). But even that’s not true. While we had a great success in Richmond, we didn’t match that against a Lib Dem council in Sutton – where they strengthened their hold. What does seem to have happened that the ‘traditional’ Conservative block of stable Conservative councils (Wandsworth, Westminster and K&C) seems to have been joined by Hammersmith and Fulham.